The Sir Charles Clore Hostel was established by the ICA in 1976, with the generous contribution of Sir Charles Clore of blessed memory. 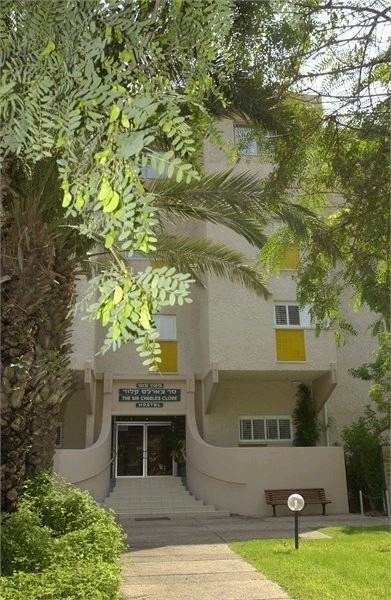 The ICA-operated Hostel is located in Givatayim, adjunct to the ICA offices, Beit Mati, in a building encompassing a well-kept garden. The building recently underwent a general renovation for the welfare of Hostel patients, with financial assistance from the Clore Foundation, headed by Dame Vivien Duffield, daughter of the late Sir Charles Clore. ICA Hostel serves as a home away from home for cancer patients receiving treatments at oncology institutes at large hospitals located in the central region. The Hostel offers training, guidance and follow up services following radiation therapy and/or chemotherapy. Some 800 patients were treated at the Hostel from July 2012 to July 2013. The Hostel staff consists of registered nurses who are experienced in oncology nursing. The staff provides professional supervision and assistance in coping with side effects of chemotherapy and/or radiation therapy and various related-diseases. Treatment for side effects resulting from oncology treatment. Continuity of treatment while maintaining contact with medical staff at the oncology institutes and in the community. Membership at Shahal (cardiac emergency services) as required. There is a group of volunteers who are active at the Clore Hostel; they accompany patients to oncology institutes (Tel Aviv Sourasky Medical Center, Sheba Medical Center at Tel Hashomer, Assuta and Davidoff Center) and assist them as required. The afternoon and evening leisure and enrichment activity is also conducted by volunteers. The referral to Clore Hostel is processed through oncology institutes or departments where patients are admitted via attending personnel (social worker, nurse, physicians, radiation technicians). A Treatment Referral Slip from his/her healthcare fund (form no. 17). A referral from attending physician at the oncology institute. A copy of the Discharge Summary from the last hospital stay. An Attending Family Physician Statement containing medical background information. Listing of all regular medications taken by patient. A 5 day stay from Sunday morning to Thursday afternoon. Spacious rooms shared by two patients. Each room has its own en suite bathroom, air-conditioning and a communication system for nurse-patient communications. A cultural hall, TV rooms, arts and crafts room. Three meals a day, including fresh and diverse dishes cooked on the premises and adapted to the dietary needs of the patients. Daily transportation to and from hospitals, accompanied by skilled volunteers. A wide variety of leisure activities; exercise, arts and crafts, cosmetics, Internet station. Support groups and lectures featuring professional moderators. Option of participating in activity held at the "Strong Together" Support Center at Beit Mati, ICA Offices, adjacent to the Clore Hostel. Fund the accommodation of a patient in the Sir Charles Clore Hostel - US$ 2,400 per month. Kindly contact us, should you wish to contribute to this project. Please note that all donations received are transferred in full (no overhead is taken).